Pledge Sheet for Imprisoned Workers of the World, ca. 1923. Committee for International Workers Aid (formerly "Friends of Soviet Russia") was a Communist organization created in Berlin in 1921 (as the International Arbeiter-Hilfe) to help raise money for famine and drought victims in Russia. It was evidently expanded to include collecting money to help victims and prisoner of Fascism, which seems to be the major target of this folding broadside. The bucket here is a paper one, the pamphlet unfolding to be a broadside or broadsheet onto which you'd record peoples' names and addresses and the amount of their contribution to help "class war victims of the laboring masses", to help the imprisoned and their families ("they are in for us who are out". 12.5x8 sheet folded into quarters. Fine condition save for a tear that I just made at the bottom center fold. This is a scarce item--I could only find two copies (Yale and UC Davis) in WorldCat. If you were sitting in a cafe on a cold winter morning in Guthrie, Oklahoma, on January 13, 1920, and opened to page two of the town paper, The Leader, and worked your way down the page, past the ads for KiMoids heartburn pills, Jiff-Jell gelatin desserts, eczema cream, dress patterns, liver pills, adventures to sunny California, and Mr. Louis Bennison starring in a play called "High Pockets", you'd find a picture of Albert Einstein. Snugly nestled amidst this visual candy is a short report on one of the great experimental results of the 20th century, the verification of the general theory of relativity. Results of the observations made during the May 29 eclipse and then reported to a joint meeting of the Royal Society and the Royal Astronomical Society on November 6, 1919, confirming the theory was an enormous occasion. Einstein of course expected it; had the results not obtained, he quipped then that The Creator would have some explaining to do. But everything turned out just fine. J.J. Thomson (as president of the Royal Society) closed the great meeting and and remarked that "This is the most important result obtained in connection with the theory of gravitation since Newton’s day, and it is fitting that it should be announced at a meeting of the society so closely connected with him. . . . The result [is] one of the highest achievements of human thought." Thomson was not given over to being hyperbolic, and if anything was just stating the case as it was. The event was carried loudly by leading newspapers all in about a week or so after the event, the effect of which established the beginning of Einstein being about the most famous man in the world. Two months earlier he more than likely would have been an unknown except to a very small percentage of a reading population. And so here he is, in almost the center of Oklahoma, and then almost in the center of the U.S., in a tiny report--but the report had a photograph, and the story was at least on page two, making him a known-something in about the middle of the middle. The Guthrie daily leader. (Guthrie, Okla.), 13 Jan. 1920. Chronicling America: Historic American Newspapers. Leafing through an unusual piece of 1930's Soviet news I came upon a rusty paper clip secured at the bottom of a single page. I'm a fan of found book art, so I read a bit of what it was that it was possibly marking for attention. There was a word that jumped right out at me just above the metal dog ear--"liquidation". The document, Rosja Sowiecka (Soviet Russia), was part of a Polish translation program of Soviet new that was done at the request of the U.S. Embassy in Warsaw, with each slim (ca. 100pp) volume it seems to me reviewing events in the U.S.S.R. primarily from the few months before its publication date. This one was volume and published February 28, 1934, which would place it in the thick of a particularly brutal period of Soviet history: there was the Soviet famine of 1932-33 (just ten years after the last great famine there), the Holomodor of 1932-3 (in which 10 million Ukrainians were murdered via famine), a completely oppressive police state of massive suspicion that would lead to the deportation and death of millions, the Great Purge, and much more that would nearly cause a collapse of the Soviet Union come 1941. The "liquidation" here though was being used in reference to dismantling the farm collectivization scheme that lead to the destruction of so many millions of people, and was coming at the suggestion of 'rightist" (meaning more liberal) leadership in the Soviet government. In this particular case, the suggestion was that of Martemyan Nikitich Ryutin, a high-level political functionary who was pro-peasant and definitely anti-Stalin, a stance that would lead in 1937 to his arrest and execution (all in a 24-hour period, like so many of them). Even though I really only know the highlights of Soviet history in the 1930's, reading this section of the document definitely left me with a sad admiration for this man and his allies, because nobody was allowed to survive under Stalin who was not a believer in his removed self. This was the path of following a simple paper clip. The bottom line of the 63-day-long Second Warsaw Uprising (August/September 1944) is that the Soviet Union allowed the Polish Home Army to fail, watching from its position across the Vistula as the Nazis and Poles slugged it out, both exhausting themselves, the Nazis ultimately defeating the Poles, eliminating most of the Soviet concern for the Polish military and government, allowing the Soviet Union to take the country over more completely when the time came a few months earlier. It was the Soviets' choice to see two enemies annihilate themselves to have more control over Poland and immediately turn it into a vassal state when it rolled into Warsaw in January, with 85% of the city destroyed ("at the moment of its fall practically the whole city was rased [sic] to the ground") and 600,000 of the city’s population dead, along with 80% of the Home Army. “Progress of large-scale operation on 16 May 1943, start 1000 hours. “180 Jews, bandits, and subhumans were destroyed. The former Jewish quarter of Warsaw is no longer in existence. The large-scale action was terminated at 2015 hours by blowing up the Warsaw Synagogue. 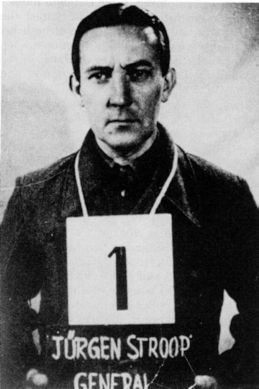 Stroop was arrested and hanged in Poland, in Warsaw, in 1952. So, this 6-page pamphlet, published by Liberty Publications in London at the end of 1944 (and received by the Library of Congress on 10 January 1945), detailed the misery of the non-recongition of the second Warsaw Uprising and the reason(s) for it. It details the travesty, the disinterest, and the political accomplishment of the Soviet Union gained by its criminal inaction. There is of course no mention whatsoever of the first Warsaw Uprising. Selfish inaction breds itself, consumes others and then--like yeast--consumes itself. 1. "WHEN THE revolt in the ghetto broke out in April 1943, all of Warsaw was aware of the fighting. The news of the revolt was transmitted to the Allied capitals by the Polish underground, but no help came for the Jewish fighters - not from the US or England, nor from the Soviet Union; not even a sign of recognition or an acknowledgement by the Allies of the battle raging in the ghetto. The Jewish fighters in the Warsaw Ghetto were unknown soldiers, isolated from the world. Only two years later, after the end of the war, did their valiant battle receive universal recognition." --"Who Defended The Warsaw Ghetto? ", by Moshe Arens, in the Jerusalem Post, 29 April, 2003. 2. The ZOB was the Zydowska Organizacja Bojowa, led by Mordechai Anielewicz, and ZZW (Zidowski Zwiazek Woskowy) led by Pawel Frenkel. At first this image looked like the cover of one of Hugo Gernsbach's science fiction magazines given the number of dining tables and sleeping quarters, but no--it is the front cover of the January 1929 issue of Popular Mechanics showing what I believe would be a cross section of the airship R100. It would be easy to assume that this was an artist's creative attempt to show the interior of a rigid airship sometime in the future, given the size and scope of the accommodations for the passengers. But as it turns out, it is a drawing of the interior of what I'm pretty sure would become the British airship R100. The article appeared just months after the first commercial transatlantic rigid airship flight, a 111-hour accomplishment by the Graf Zeppelin (LZ-127). Seven months later, in August, the LZ-127 would make the first around the world flight in 21 days. The R100's first flight would occur four months later on 18 December 1929, all 719' feet of her (with a massive 133' diameter), with her crew of 37. Welcome! This blog started in January 2008 as a history of science blog that related to my bookstore, but within the first two months the content spilled over into all sorts of unexpected areas, and I've happily not tried to steer a clear course since then. The categories bar makes sense of the mass of the posts, I think. At this point there are some 2730 posts (plus another 1200 Quick Posts) that run about 2 million words and illustrated by 7000 images. This blog has been referenced or has been re-posted in The New York Times, The Times, Scientific American, Le Point, Slate France, Le Monde, Le Figarro, The Economist, The Wall Street Journal, Boing-Boing, Jezebel, Wired, Bloomberg, Discovery News, The Guardian, the Huffington Post and many other places, and has been viewed more than 4 million times. It seems to me that I have seen dozens of such illustrations of maps showing Germany surrounded, graphs of military capacity, data visualizations of naval strength, men under arms, and so forth, showing the imminent demise of the spent, Versailled, and used-up but potentially recovering Germany. And so, behold! The potential enemies of Great Britain, 1929. It might be conceivable that it is France and France alone setting up those "long-range guns", what with the long history between the two countries and all, though it seems as recent allies this would not be the case. The enemy could be the feared invasion of visitors from the Continent coming through a tunnel that was far from being an actual project. Or it could he someone else advancing through France to the coast to threaten the Brits, Calais being the closest point bewtween he two countries across the channel, and the spot where much of the German high command (excluding Rommel) thought that the D-Day invasion would come, even after the invasion had begun. Unfortunately we don't know what the purpose of this drawing was...except that it would come close to being true in another 11 years. I came upon this curious pamphlet1 by Maurice Knight, curious in itself, being a manufacturer's catalog for gravestones/markers/monuments, which was something I knew must have existed in dozens of different incantations through the years, though I had never actually seen one. Opening the catalog I saw at the bottom the small and distinctive rubber stamp stating that this was once the property of H.L. Mencken, who shed it to the Library of Congress in 1926, and which later was sold to me in the library's Exchange Program for surplus and duplicate material. Knight was a Baltimore man and firm, and as it turns out there are numerous examples of Knight's work pictured ("in use") in a number of Baltimore cemeteries, but most interestingly in Loudon Park Cemetery, where the Mencken family plot is located. I cannot tell if the Mencken stones have any connection to Knight, or if Mencken was planning something else. (There are no annotations by Mencken in the text nor I guess should there be--I just state this because if I don't I imagine that someone will ask.). Mencken's family plot was already well-established, so I'm really not sure why he would have this prospectus. Anyway, here it is. The title of the catalog tells the reader to "Consult the Master"--with Mencken, I wonder who that master might have been? Ironically the location of the stone works (1025 West Mulberry St, Balto) is now a simple empty lot, its nothingness secured by a chain-link fence. Not a very romantic end to a business who purpose was remeberance. 1. Consult the Master, Maurice L. Knight, for your Monument-Tomb-Vault. Office and Works, 1025 West Mulberry St., Baltimore, MD. 9x6", ca. 75pp, with 150+ illustrations of the work of the stone master. Title printed vertically though the book opens horizontally. Original wrappers. The wrappers are scuffed and bumped a bit around the edges, though the text is bright and clean. Provenance: stamped on the reverse of the title page "Gift/Mr. H.L. Mencken/March 30, 1926", being a gift to the Library of Congress, with their surplus stamp on the rear cover. I've noticed a few interesting articles on the circular ship from mid-late 19th century; I don't really have much to say about them except that I appreciate their structure and, well, beauty, and so I'm just sharing them here. First is "The Russian Imperial Yacht, 'Livadia'", which is an article in Nature, July 22, 1880, appearing on pp 270-274, with several large illustrations, including an elevation and a plan of the ship. Next is this fantastic set of drawings for a proposed circular semi-submerged ship, the work of Donato Topmmasi of Paris, and which appeared February 24, 1877, in the Scientific American, page 115. And here we have another in the short but interesting series, "Ships in the Skyline", a data visualization and creative display of information of high order and somewhat cross-species order. (Others in this series can be found by searching the title in the Google search box at right.) This example appears in Scientific American on September 19, 1904, and shows the newest (yet to be named) Cunard Steamship Company fleet addition, a monster 800' long and with 75,000 horsepower. It is placed side-by-side to Trinity Church, which was the tallest structure in Manhattan for decades, and nearly rises to that height; in the center panel the new ship (is this to be the Lusitania?) is place on end next to and dwarfing the Park Row Building, which was the world's largest office building in 1904. The images do press and get their point across very well, I think, in trying have the general reader understand the enormous size of the new "Cunarder" in terms of something that is known, making the stand-alone mass of the new ship more understandable in terms measurement of some other well known thing. This is a beast, and the beast was a tunnel digger. This image is from the article "Le Creusement Mechanique des Tunnels" and is captioned "Vue de face de la machine creuser les tunnels", with "creuser" meaning to dig, and the entire thing meaning, simply, "front of the tunnel digger", though it sounds much better in French. It appears in Cosmos, Revue des Science et de Leurs Applications, which was published in the weekly issue for 26 November 1910. This is the only science journal/magazine with a cover illustration featuring the Creator of the Universe. What a wonderful thing this machine was, though right after I think of how many backs of laborers it saved, I am moved immediately to what an engineer would do if the machine got stuck.